Markets: Forex, Stocks, Metals, Futures, CFD, Indicies. The system was designed to run on the M30 timeframe. Long Entry Rules: 1. Up arrow appears on the chart, and 2. RSI is above the level 50 line, and 3. the black Stochastic line has crossed up the lime Stochastic line and they are above the level 20 line. Buy Exit Rules: 1. Down arrow appears on the chart, and 2. the black Stochastic line has crossed down the lime Stochastic line and the Stochastic lines are falling below the level 80 line. Short Entry Rules: 1. Down arrow appears on the chart, and 2. RSI is below the level 50 line, and 3. the black Stochastic line has crossed down the lime Stochastic line and they are below the level 80 line. Short Exit Rules: 1. Up arrow appears on the chart, and 2. the black Stochastic line has crossed up the lime Stochastic line and they are moving above the level 20 line. 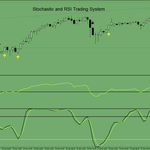 Stochastic and RSI Forex Trading system.